On a pilgrimage to Rome in May 1989, I was part of a small group that was knocking outside the doors of St. Mary’s Seminary near the Lateran Basilica. After a respectable wait, the doorkeeper answered. We asked to see the image of Our Lady of Confidence, a miraculous painting of the Virgin and Child that hangs over the altar of the small chapel. I am supposing you would like to hear the story of Madonna della Fiducia (Our Lady of Confidence), and a very good story it is for our times, I promise you. The picture was painted by the great Italian painter Carlo Maratta (1625-1713), who was knighted by Pope Clement XI in 1704 and made court painter by Louis XIV the same year. It is said that the renowned artist gave this painting to a young noble woman, who would become the Abbess of the Convent of Poor Clares of St. Francis in the city of Todi. That Abbess, today Venerable Sister Clara Isabel Fornari, embraced a severe life of penance and was favored with many mystical graces; she even received the Sacred Stigmata of Our Lord’s Passion. Sister Clara Isabel had a great devotion to the Blessed Mother, like all the saints, and a very special attachment to this maternal image of Our Lady with the Divine Infant. For Our Lady had made a remarkable promise to Sister Clara Isabel that would win special graces for herself, her sisters and all those through the ages who would venerate this image. Many persons, especially converts, would like to increase their devotion to Our Lady, and wonder how to go about it. In this promise lies a simple solution: simply go to Our Lady of Confidence and ask her. Let me transcribe in Sister Clara Isabel’s own words the special promise Our Lady made her with regard to this image: “My Heavenly Lady, with the love of a true Mother, assured me that She would give a special tenderness and devotion toward Her to everyone who contemplated this image.” (This promise applies, of course, not only to the original picture, but also to all the copies of it that circulate). My Mother, my Confidence! (300 days indulgence). This explains why our little group of pilgrims was so eager to venerate the image of Our Lady of Confidence. But why were we in Rome, and not Todi, where the original picture is venerated to this day? 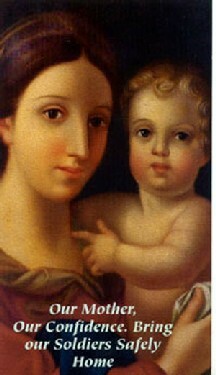 Due to numerous cures and conversions worked through the intercession of Our Lady of Confidence, copies of the portrait were made and circulated. One of these copies was placed in the small chapel of St. Mary’s Seminary at the Lateran Basilica in Rome. The seminarians soon realized that their prayers and needs were always attended to by the Madonna della Fiducia. Further, Our Lady of Confidence protected them in times of crisis. She granted the seminarians full protection against the scourge of Asiatic flu, which claimed many lives in Rome in 1837, and again some 30 years later. During World War I, when over 100 seminarians were forced into the armed services of Italy, they placed themselves under her special care. All returned home safely. 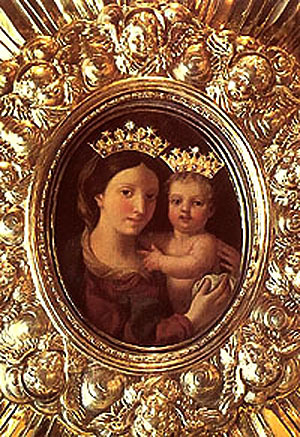 To repay the goodness of their Queen, the seminarians crowned both Mother and Child with golden bejeweled diadems. How opportune a devotion for our times – for both our soldiers overseas engaged in war and also for all of us at home, where the threat of new deadly plagues and viruses loom. My Mother, My Confidence, protect us. Today, as never before, there is a need for great confidence in Our Lady. As mankind groans under great personal pains and sufferings, momentous uncertainties and confusion, we are reaching the time when the only resolution lies in a great confidence, one could say almost unbelievable acts of confidence in Our Lady. This is particularly necessary today when the firm columns of Truth and Morals seem to be vacillating in the Holy Church as a consequence of the progressivist principles approved by Vatican Council II. The picture teaches us what the Holy Church has always instructed: Our Lord Jesus Christ always acts through Mary as a channel. All conversions and favors take place by means of and through the intercession of this Blessed Mother. We need only approach with the confidence of a child in his mother to be certain she will attend to our needs. Mankind today does not have this lively confidence in the maternal love of Our Queen, and, because of this, we do not take advantage of the universal channel of grace for mankind. Mater mea, fiducia mea - My Mother, my confidence. With this small prayer, says a pamphlet published by the Lateran Seminary, Mary asks for nothing but offers everything. In this holy season of Advent, as we prepare for the birth of her Divine Son, let us invoke Our Lady of Confidence and ask for everything – a true devotion to Mary, the graces of conversion for not only our family and friends, but for our leaders and prelates, and the complete restoration of Holy Mother Church and Christendom. A color postcard of Our Lady of Confidence is available from TIA, Inc.